Once upon a time it was important for a king to have a clown in his court. 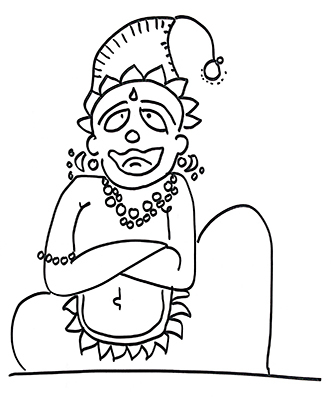 The clown was called Vidushak in India. The Vidushak was the only person allowed to make fun of the king. He would mock the king, abuse the king, imitate the king’s mannerisms, make light of royal declarations and decisions. In other words, he openly said what no one else dared say. The Vidushak’s caustic words and barbs and jibes enabled the king to question his own decisions, challenge his own thoughts, become aware of reactions and opinions that was otherwise kept hidden out of fear of royal reprisals. For that he had to pay a price: he had to dress like a fool, and look like an idiot. He had to be the fool. This was important because if he crossed the line and offended the king he could claim immunity from royal rage on grounds of being not-so-smart. The tradition of the Vidushak died long before the end of kingship. One can argue that kingship faded away because the Vidushak died. For with no critic around, there was no chance of course correction. With the rise of democracy, and modern institutions, the Vidushak has probably been secularised. So we have cartoonists and stand-up comedians and talk-show hosts taking up the role of the Vidushak. They use satire and wry humour to draw attention of the state and those in authority to the follies of their way. But they are not allowed to thrive. Cartoonists have been jailed for being too bold. Talk shows have been shut down. Stand-up comedians have suddenly found their houses being ransacked. The jester continues to scare kings, democracy and free speech not withstanding. This is not a case of freedom of speech. This is case of trying to get authorities to hear using humour. It is about making criticism less venomous, a hint that the king has to take. But kings often don’t take the hint and so the joke becomes more sharp. The jester hopes he will he heard if he is more caustic. Unfortunately, it only causes more pain, more rage, until one day the king has had enough. Most of us rarely see the dark side of laughter. Every day millions watch comedy shows and spoof shows. We seek political cartoons. We enjoy satirical articles. We are grateful at the laughter. When we laugh we feel de-stressed, relieved, relaxed. It enables us to tolerate nonsense. We laugh at the ridiculousness of life. Yet, we forget, that more often than not we laugh at someone. And that makes us feel superior to them. This feeling of being superior is at the key of a good joke. Remember all those Sardar jokes, Blonde jokes, Madrasi jokes, Alok Nath jokes, Gay jokes. When we feel superior, we end up making someone feel inferior, stripped of power, so that someone can have a good laugh. Unfortunately for society, the king is not amused.